I decided to play safe & took a recipe from Joy of Baking. The recipe called for using cranberries, but they are not available around, so I skipped them. Even apples & pears were local produce & not tart tasting. 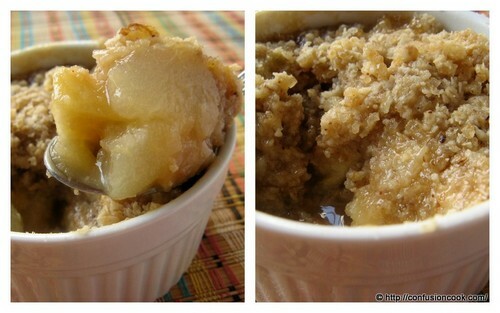 Probably that is why i found the crumble a bit too sweet. So next time I am going to either use a tart tasting fruit or reduce the sugar. 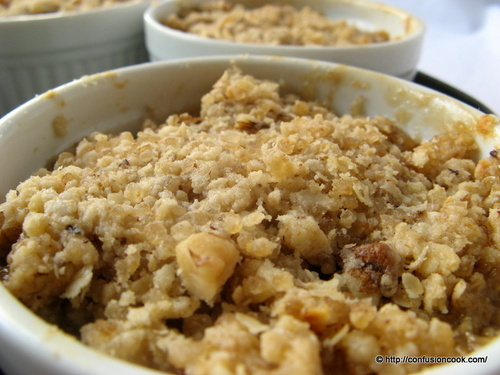 I also used quick cooking oats as old-fashioned rolled oats were not available. 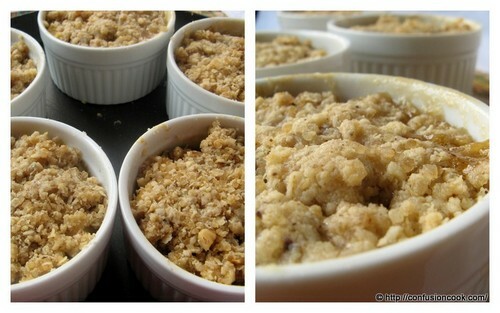 I baked the crumble in individual 6 oz ramekins as I do not have a pie dish. This was the first outing for my ramekins as they have been languishing in their carton since traveling 7 seas (US to India) last year. The filling was sufficient for 5 ramekins. Pre-heat oven at 190 C. Grease required dish. I used 6 oz ramekins. Place all topping ingredients in a large bowl. Use your fingertips or pastry blender or a food processor to gently bring them together. I used a potato masher. Peel, core & chop into 1″ chunks both the fruits and place in a large bowl. Add corn starch & sugar. Toss them to coat fruits evenly. Place the filling in the prepared dish, evenly spread the topping on top of it. Place the dish on a baking sheet to catch any dripping juices. Bake in pre-heated oven for 35-45 mins. or until bubbly and the topping is brown and crispy. Remove from oven & cool on a wire rack for 15 mins. 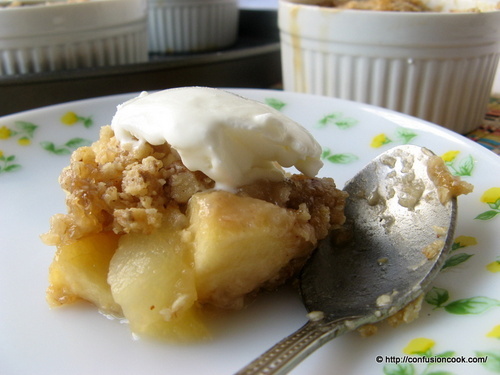 Serve warm with a scoop of ice-cream or whipped cream.